Spring is here! I don’t know about your neck of the woods, but here in Ohio we had temperatures in the 70s this weekend! That’s so far above freezing! I wasn’t quite sure how to handle it at first. Which is ok, because the weather will change within a couple days and I won’t have to worry about managing such scorching temperatures for a little while. The husband and I took advantage of the warm weather to work on building the deer fencing for our (my) future garden! You may recall my excitement over seeds when snow was still on the ground. The seeds and my excitement are growing! More on that another day, though. With the coming of spring and outdoor projects comes less time spent in the kitchen. I recently seasoned my cast iron skillet we received as a wedding gift and took a couple stabs at making a dinner time frittata. The first one went into the “not so successful” file. Literally. I have a file with that name. The second one was much better. I imagine I will come up with better combinations, but I wanted to share my first successful attempt in order to get some feedback and ideas from my fellow food-obsessed friends out there. So please drop some comments with ideas! 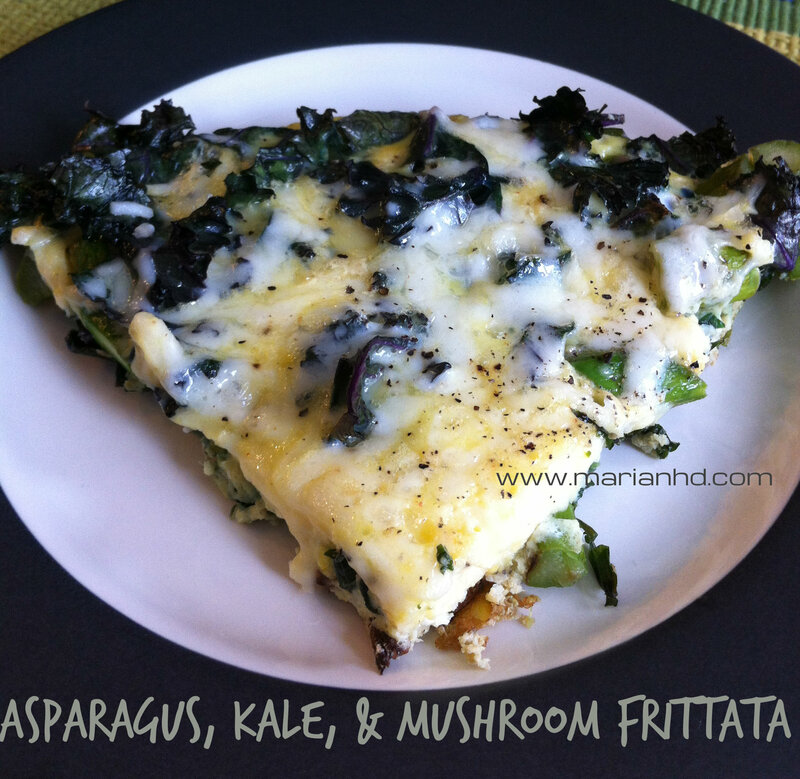 What I love about the idea of a frittata is how quick it is and how easy it is to incorporate fresh veggies. If I have eggs in the house, there’s no reason why I can’t whip this up in under 30 minutes any night of the week. Add a slice of toast and some fruit and this is a perfectly satisfying dinner for two with leftovers for breakfast the next morning! By the way, this is my first blog post since becoming an official Meatless Monday Blogger on Board! Click on their link or the logo below to find more bloggers dedicated to providing delicious meatless recipes on Mondays. 1. Preheat your oven to 375 degrees. 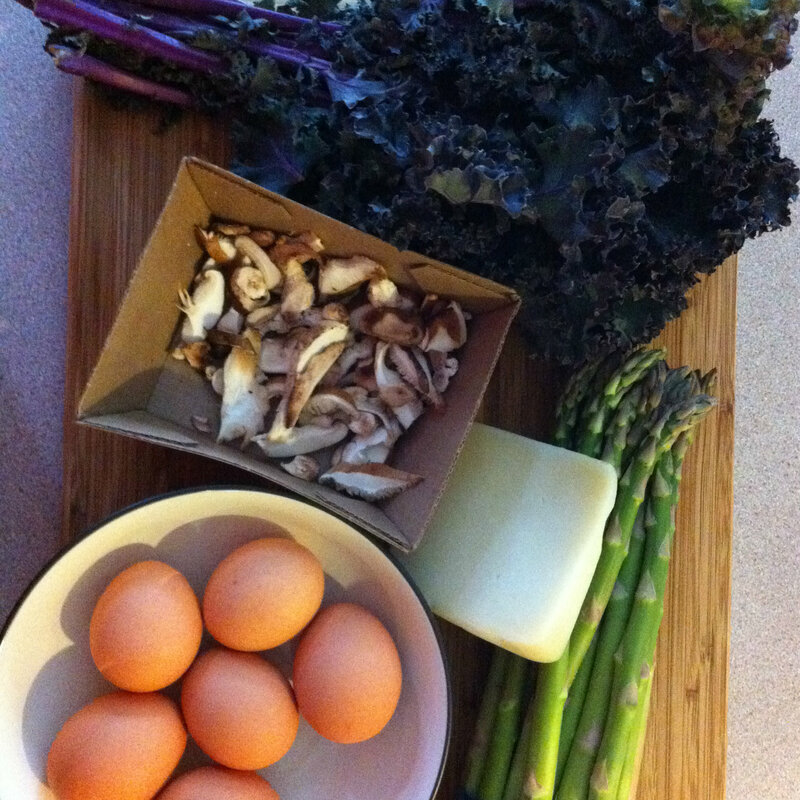 Wash your veggies, trim your kale off the stems and cut into 1-2 inch pieces. Trim your asparagus by bending the bottom ends until the naturally snap. This will make sure you get the woody parts off and keep the good stuff. Slice the asparagus into 1 inch pieces. 2. 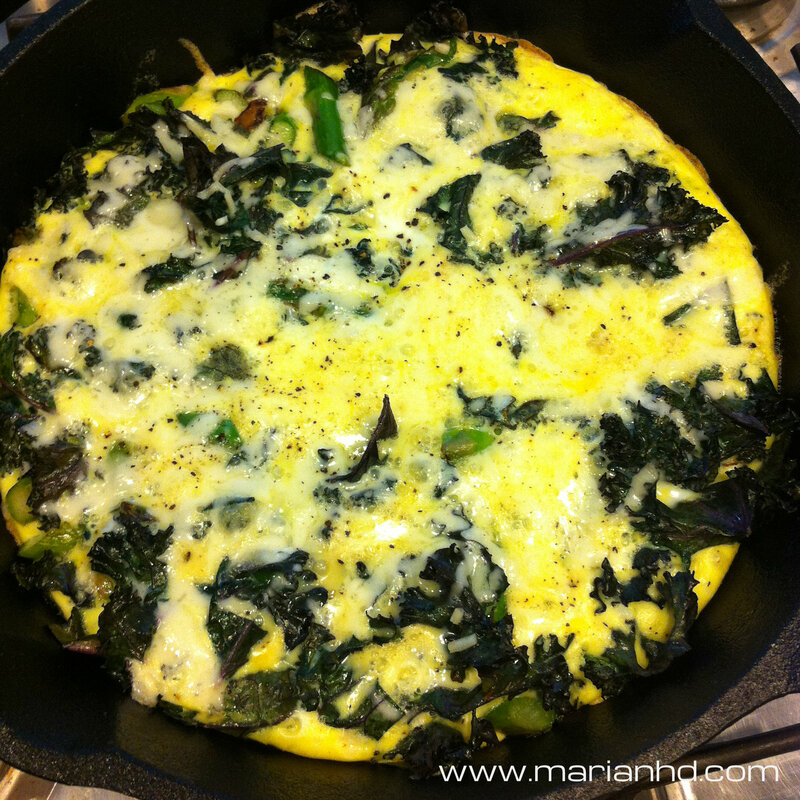 Heat the olive oil in an oven-safe skillet over medium heat (I recommend cast iron skillet if you’ve got one). 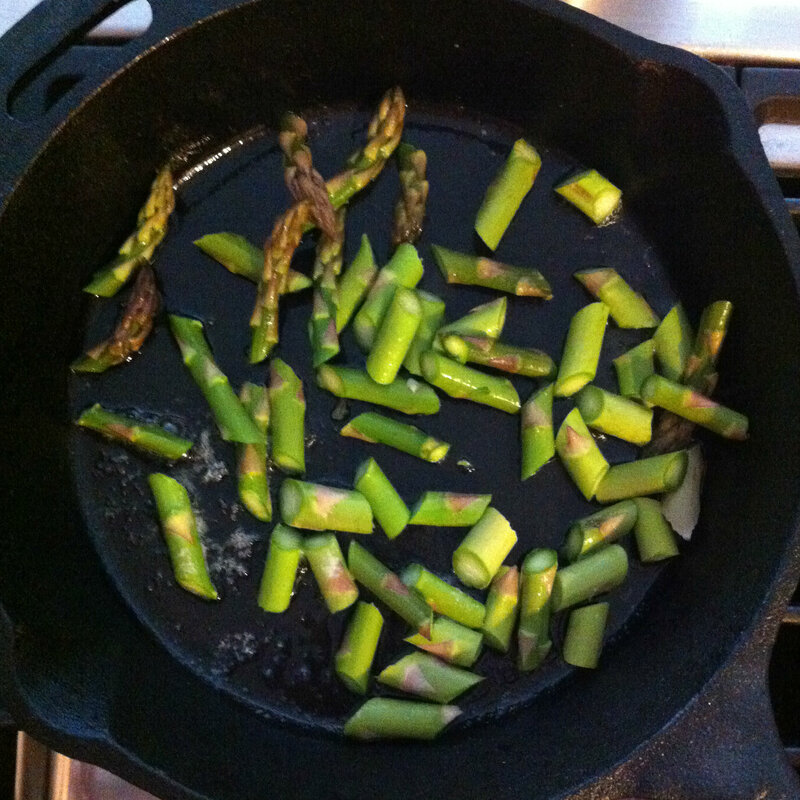 Saute the asparagus for about 3 minutes. 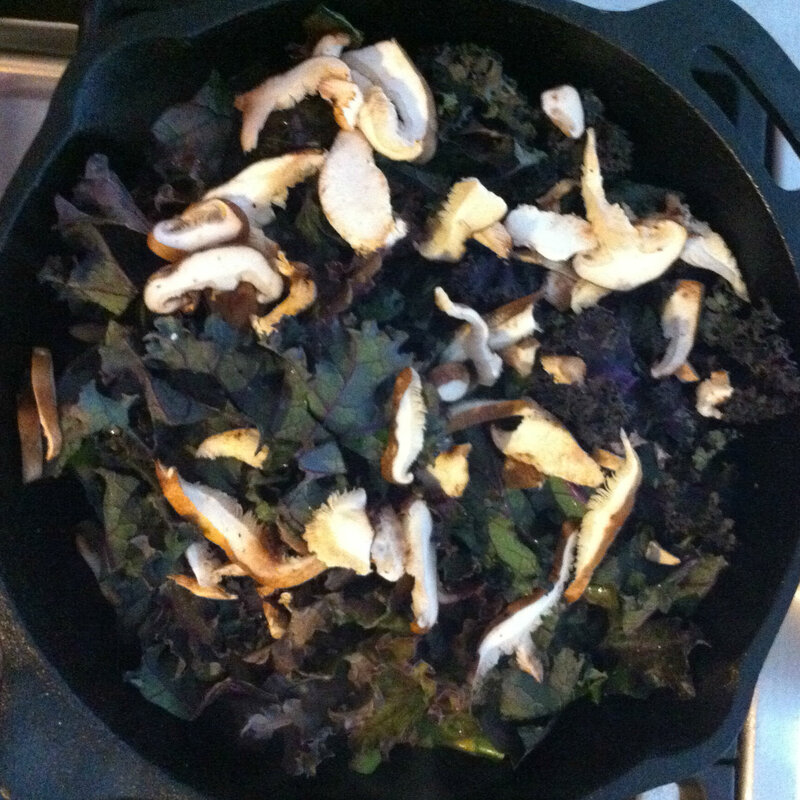 Add the kale and mushrooms, cover and cook for an additional 4-5 minutes, or until the kale has wilted and reduced in volume. 3. While the veggies cook, beat the eggs in a separate bowl. 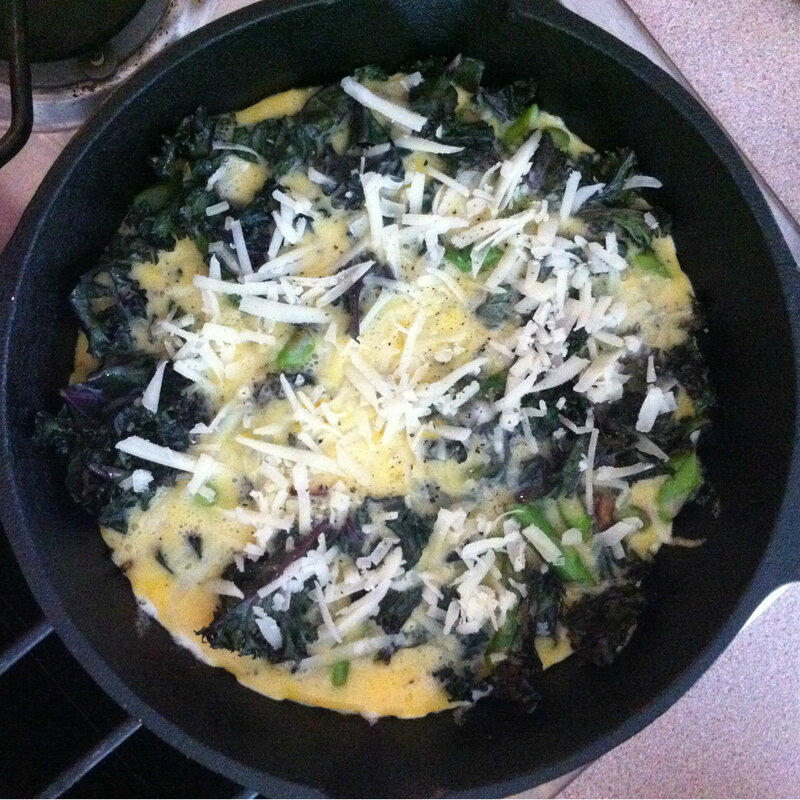 Pour the eggs into the skillet and season with salt and pepper and spread the shredded cheese on top. Cook until the eggs are starting to set on the edges, about 3-4 minutes. 4. Transfer the pan to the oven and bake for about 10 minutes, or until the eggs are completely set and a knife inserted in the center comes out clean (minus melted cheese).